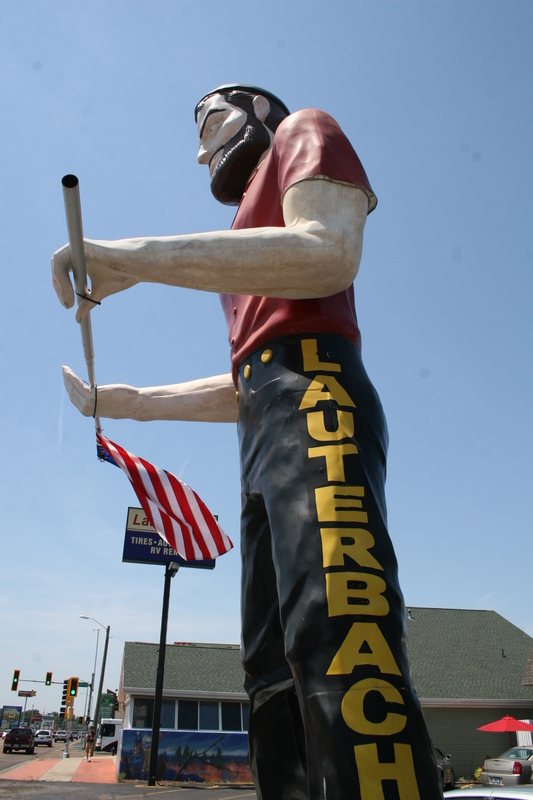 Standing tall in Springfield, IL the Lauterbach muffler man is one of the better known muffler men out there. He owes this mostly to his popular location standing on historic route 66 in west central Illinois. He appears across the internet in many pictures taken by visitors as well as in Gabriel Aldaz’s book. He is a classic bunyan version and is actually one of the first one’s made judging by the way his arms are connected to his body. This muffler man was featured in American Giants 2nd episode and myself and the guys visited him in the summer of 2012 and were able to get his story and history. In 1952 Russ Lewis started Midtown Tire where the Hilton hotel now stands. 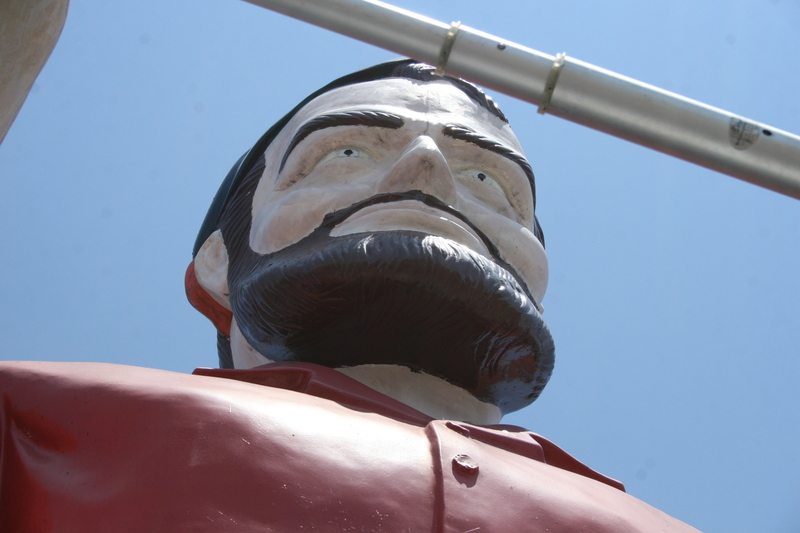 Business was good and in 1961 he opened up a second store at the corner of State and Laurel and in 1962 purchased what at the time was a brand new Bunyan giant from International Fiberglass in Venice, CA. In todays money a muffler man in 1962 sold for about $13,600, at the time that was about $1,300. Sadly that store only stayed open another year and when it closed the giant was sold to the Round up Cafe 24 miles to the south in Farmersville, IL. The giant stood there for the next 15 years until 1978 when I-55 was put in and the giant was sold back to the Lewis family. 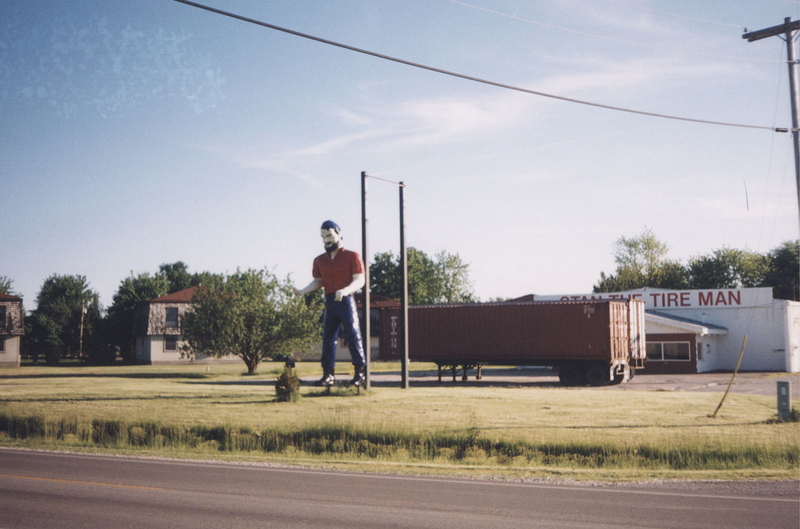 That same year the giant was set up on Wabash Ave at it’s current location and has now been there for 25 years. In 1962 he held a tire in his right hand and today he holds a flag pole, I have yet to see a picture from his days at the Roundup Cafe and I am not sure what he held during that time. Life has not always been perfect for this Bunyan. On March 12, 2006 a two F2 tornados came through Springfield in what was the worst outbreak of tornados since 1957. They caused a total of 150 million in damages and picked up the roof of the Barrel Head restaurant next door to the bunyan and carried it south out over the street. The roof then came back to the north and connected with the head of the bunyan which at that point joined the roof on it’s journey down the street and ended up about 4 doors down to the east. The newspaper shot a famous picture of a neighbor carrying the head back to Lauterbach after the incident. A local body shop repaired the head and the bunyan has been doing pretty well since then. As an interesting side note also covered in American Giants Episode #2, Russ shared with an acquaintance the success of his newly acquired giant. 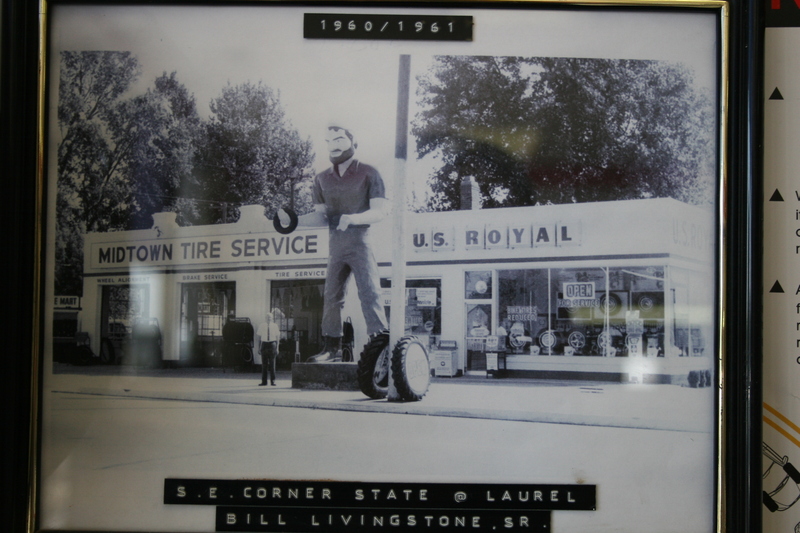 So sometime around 1963 Stan the Tire man in Salem, IL also purchased a bunyan for his tire store. A few years later in 1965 when the Uniroyal company did their promotion with the Uniroyal Gal Stan also acquired one of them when the promotion ended and the gal was left at his location. 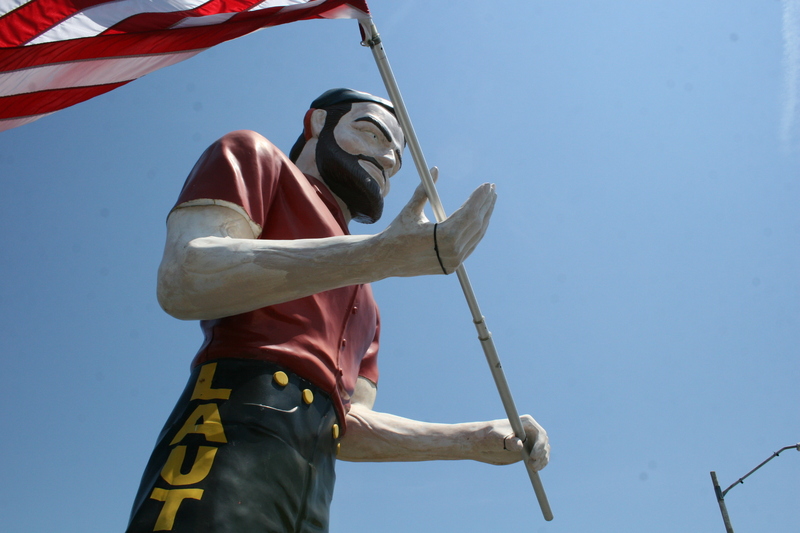 The two stood together for a time before the bunyan was finally sold to a collector in NC and the gal moved south the Stan’s store in Mt Vernon, IL where she still stands today. I just want to thank the guys at Lauterbach for taking the time to talk to us and for the information Jay shared with us during out visit. Also want to thank Darren Snow for the use of his rare picture taken in 2000 while the bunyan stood at his original location in Salem after his “wife” had moved on and before he was moved to NC.